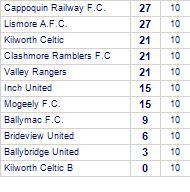 Brideview United come from a confident 3-0 win at home against Lismore A.F.C.. They have yet to be beaten away from home. Prediction: Home Win for Cappoquin Railway F.C. Cappoquin Railway F.C. 's last game was a straightfoward 3-1 win at home against Mogeely F.C.. They are currently on a winning streak of 7 games.They They have won 3 out of 4 home games. Brideview United come from a poor 1-4 loss at home against Valley Rangers. They are currently on a losing streak of 5 games.